What are You Writing in Your Book? I was reading a friend’s blog today. She wrote about being called to the phone years ago when she was in school because her mother was dying, and about the last tender and loving conversation they had. Later, someone she didn’t know very well came up to her and said that she had inadvertently overheard the conversation from a nearby room. This person offered words of comfort as best she could. My friend wrote that these words meant a lot to her and reminded her of the importance of sharing our hearts with those we love. The writing was so eloquent and deeply moving that I went to my friend and started crying as I expressed my gratitude for her sharing this story. She replied, “Don’t you remember? The person who came up to me was you.” In the years since, we have developed a friendship I treasure, but I do not remember this early encounter. I wonder how many other encounters I’ve forgotten that made some lasting impression on someone else? And what kind of impression did I leave? Some I would not be proud of now, I’m sure. So my friend gave me two gifts today. First, the touching story of saying goodbye to her mother. And second, the reminder that with every word and deed, I am writing the book of my life, and I never know when someone will be reading. My daughter stormed into the house after school. She had had an argument with a friend. As she described the argument, she became more and more puffed up with her own sense of rightness. She grew angrier and angrier with her friend’s stubborn, bull-headed refusal to see what was to her the incontrovertible, inescapable, clear-as-the-nose-on-your-face-you-must-be-a-moron-not-to-see-it rightness of her position. I listened without comment. When she finally began to wind down and looked to me for validation of her outrage, I simply said with a smile, “Who cares?” Well, that was not what she was expecting. While she was standing there with her mouth agape, momentarily speechless, I jumped in before she could protest. “Do you want to be right or happy?” I asked. I asked her to think about the topic of their argument and to consider whether being right about that topic was worth the emotional upset she was experiencing. As she did a quick cost/benefit analysis, I could see her body relax and her spirit calm down. On a different occasion, I was having lunch in a restaurant with some colleagues. I ordered something that had a french name. As soon as I said it, the server corrected my pronunciation. I speak french passably well and lived in french speaking countries for several years, so I was confident that I had pronounced the dish correctly. So in turn I corrected the server, with a not so subtle I-know-better-than-you tone. And after he left the table, I commented on how rude he was. Even if he had been right, what bad form to correct a customer in front of other people. Only later did I see that I had done exactly the same thing to him. Wouldn’t we both have felt better if I had just let his mistake pass without comment? As I’m writing this, I am thinking back to several times when I committed a faux pas in front of someone who was in a position to cause me great embarrassment by pointing it out. In each instance, the person said nothing. In one instance, the person even went further by quietly correcting the mistake I made so that no one else would see what I had done. Much later, when I realized my mistakes, I was so humbled by the graciousness of these powerhouse people. My mistakes, in the big scheme of life, were minor, but the kindness of their actions was immense. “There is a saying that the world is divided into people who think they are right.” I would rather be part of a world undivided by people who choose to be happy. I love maps. I especially love maps that have a little red arrow pointing to a spot that says “You are here.” You can see maps like that in the mall, on a hiking trail, on a college campus, or even on the back of your hotel room door. I took my mother out to dinner when she visited me years ago when I was living in Paris. I invited some friends whose company I thought she would enjoy, and we went to a very chichi restaurant with a huge window framing the nearby Eiffel Tower. Through the entire meal, as we dined on pigeon (which sounds much fancier in french–I couldn’t help wondering if the chef had snatched a few off the windowsill), my mother regaled everyone with tales of my childhood. And while it was an entertaining story (my friends would say hilarious), I kept staring out the window at the dazzlingly illuminated landmark and all I could think was, “Whose childhood was that? !” Certainly not the childhood I remembered, but I could see that she believed every word she was saying. I realized that there was not an objective past, but rather two pasts, hers and mine, each vividly real to the one remembering. Let it go. It is not here. If we are not drifting in the past, we are often anxiously rehearsing the future. Have you ever gotten mad at someone in anticipation of something that you think that person might do or say? I have written in earlier posts about my habit of casting into the future with my “what if” lure. I can spin out scenarios faster than the speed of light. My brain races from one to the next, churning up emotions in reaction to events that have not happened and may never happen. It’s exhausting! I am reading a book right now timely titled You Are Here by Thich Nhat Hanh, a Buddhist monk from Vietnam. In it, he describes a practice called “stopping and deep looking.” He suggests that we can use a stop sign as a reminder–very practical! We can stop anytime and anywhere, and bring our attention back to the present moment, the only time that is real, the only time we can be truly alive. We can take a deep breath and simply be aware of where we are. Sometimes I check in quickly with my senses. What am I seeing, hearing, tasting, feeling, smelling? What can I sense in my body? In my heart? One more deep breath. I am here. At least for a nanosecond. I am lucky that I live in a neighborhood with so many stop signs. My daughter Lily grew up in China, in an orphanage. She joined our family when she was a teenager. The first thing that anyone notices about Lily is her smile. She smiles a lot. It was the first thing I noticed about her when I met her in China. I fell in love with that smile. When I went through the process to adopt Lily, there was a lot of red tape. Her adoption was more complicated than most. From the beginning I was told it was a longshot. But I proceeded, holding onto the tiny hope of possibility. So many things had to fall into place. The successful completion of each step was a miracle. During that time Lily and I wrote letters to each other. She smiled even through the Chinese characters I had to have translated. And then finally, there I was with her in China. So close to getting her home. I couldn’t imagine what it must be like for her. When I adopted Mia from China she was only three. Mia grew up in the U.S. But Lily grew up in China. She had a life, she went to school, she had friends. She was leaving everything that she knew to go off with this stranger from America to who-knows-what-kind of life. She smiled. The miracles happened. I did get Lily home. And then prepared myself for a difficult adjustment period. She had a new family. She started going to a new school. She ate new food. She lived in a new home. With a dog. I kept waiting for the inevitable the-honeymoon-is-over meltdown. It never came. When things were challenging, she just smiled and said, “Everything will be all right.” Oh dear, I thought, she is putting on a brave face because she is so scared. Maybe she is afraid I will be mean, or send her back. Maybe she believes that it is not safe to share her feelings. Maybe she is just overwhelmed. Or in denial. I was sure her true feelings would emerge. However, I gradually came to believe that those were her true feelings. That was several years ago. Lily speaks English very well now. (I’m still working on my Chinese.) She goes to college. She has friends. Life is good. But here’s the thing. Her life is always good. It always has been. Not because of her circumstances, but because of her attitude about her circumstances. “Everything will be all right” is her life mantra. I’m trying to make it mine. When I get frazzled, I remind myself to trust that everything will be all right. And I smile. Some years ago, I went to my cabin in the mountains for some quality alone time–no phone, no TV, no kids. Just me and the dog. While I was there I decided that I needed to clean all the pine needles and debris off the roof. I dismissed any hesitance I felt about doing this task when I was alone. I used an extension ladder and a long rake. I was cleaning the very last section of the roof when I felt the ladder slip. I frantically clutched at the roof but there was nothing to hold onto. I knew I was going to fall. So far it sounds like any bad accident someone who has no business being on a ladder when no one is around might have. But here is where it got interesting. The instant I knew I was going to fall, I let go. I released the fear. Or rather it released me, since I clearly was not doing it deliberately. (At this point, I was not doing anything deliberately.) I was immediately filled with a sense of blissful well-being. Blissful doesn’t even begin to describe it. I don’t know words in any language to describe it. It was like being cradled in the arms of angels. Rapture. Perfection. I was conscious as I tumbled. I felt my body bounce off the ladder on the way down. I felt my back hit the edge of the deck, and then I flipped off the deck to the ground below and slid to a stop. But all the way down, I was absolutely certain that everything was exactly the way it should be. I knew that my body might be hurt. I expected that at the least something would be broken. Maybe I would be paralyzed or even die. No problem. I was in heaven. When I came to a stop, I lay there without moving for awhile. The thought crossed my mind that if I tried to move, I might find out that I couldn’t. I felt no pain–maybe a bad sign. I wasn’t in heaven anymore. I was lying on the side of a hill with my dog. I love my dog but she is no hero, and I knew I was on my own if I needed help. Finally, I started trying to see what would move. Fingers, toes, arms, legs. I slowly got to my feet, marveling that everything seemed to be intact and functioning (although I was scratched up and sore for days after). I gingerly climbed back up the hill and sat on the deck. My mind started to go to all the scary what if places. But I stopped. I had been given an exquisite gift. Two gifts, really. First, the experience itself. Second, the memory of it. I haven’t had an experience quite like that since, and I have wisely stayed off ladders. But the memory reminds me that now is always here. And that now is perfect. Now is the holy instant, the doorway to our ultimate happy place. And while I don’t suggest that anyone go flying off a roof to find it, we can pause at any time and take a deep breath to enter the gate. Here is a prayer I read today in A Course in Miracles. It reminded me of the entry I posted last Saturday, March 13, when I described getting hooked and making myself miserable with a bad dream I made up and then believed. Perhaps this prayer, or some variation of it, might be helpful to you sometime. Father, I ask for nothing but the truth. I have had many foolish thoughts about myself and my creation, and have brought a dream of fear into my mind. Today, I would not dream. I choose the way to You instead of madness and instead of fear. For truth is safe, and only love is sure. When I was a little girl, I enjoyed reading Reader’s Digest. I liked the stories about real people who did heroic things. (I still like these stories.) One story made such an impression on me that I remember it after all these years. The details are fuzzy, but the impact is fresh. As I recall, the story took place in a Muslim country, somewhere on a beach. A local woman was walking along the beach in a tourist area with a male companion from America. The account of what happened was written by the man. As they strolled along an isolated stretch of sand, carrying their shoes in their hands, they were suddenly accosted by a group of robbers brandishing knives. The thieves circled them and demanded their money and valuables. The man described his terror as he imagined his imminent painful, bloody death, and his helpless failure to protect his friend. As he fumbled with trembling hands to get his wallet out and remove his watch, his female companion drew herself up and faced the leader, who towered over her. I have no memory of why this big ol’ scary, knife-wielding man would want a pair of women’s shoes, but there they all stood, the robbers momentarily flummoxed by this tiny woman defiantly thrusting her shoes toward the leader. Her horrified companion held his breath, certain it would be his last. After what seemed like forever, the leader lowered his knife. I don’t remember what he said to the woman, but he called his band of thieves away and left the two of them unharmed and unrobbed. This brave woman understood exactly what Jesus meant when he instructed his disciples, “If anyone would take your tunic, give him your cloak as well.” I am pretty sure that in the situation described above, however, I would be much more like the man, scrambling to give the robbers whatever they wanted and hoping beyond hope they would not hurt me. In a very different scenario, I walked into my living room one morning years ago and startled a teenaged boy I knew from the neighborhood. He had come in through a door I thought I had locked, and was standing there going through my purse. Fueled by adrenaline, I screamed at him to get out of my house. (I can’t print what I actually said.) He dropped everything and ran. Emboldened by his reaction, I shouted at him from the front porch, demanding that he return while I called the police. When he kept running (what a surprise), I grabbed my keys and, clad only in my robe, jumped in the car and gave chase. Thank goodness he veered off the street and ran between two houses before I could run him over. To this day I wonder if I would have. I read about a Tibetan monk who was crying as he was being tortured by Chinese soldiers. When one of his tormentors ridiculed him for his tears, the monk explained that he was crying out of compassion because of all the bad karma his captors were creating for themselves. Forgive them for they know not what they do. Can we forgive ourselves? Sometimes my daughter is, like most any high school kid, focused on herself. Awhile back, I thought it might do her some good to think outside of her own life. So I came up with a game. Each day we would compete to see who could do the most nice things for other people. It could be something as simple as smiling at someone as you pass by, or saying something encouraging. If you did something nice for someone in your family, you got double points (because we often overlook those closest to us). At the end of the day we would compare notes and see who won. Playing the game was fun. You go through your day a little differently when you are actively seeking opportunities to be kind. I caught myself smiling more, greeting people, listening more attentively, offering to help a little more quickly, finding something nice to say. I wrote out a compliment card for someone who helped me at the store. Mia ate lunch with a student from another country who was often isolated. Playing the kindness game helps us develop the habit of kindness. It can also be played as a game of solitaire–try for your personal best! When Mia was in middle school, my foster daughter Grace joined the family. Grace got along with the boys, but she and Mia enjoyed only a brief honeymoon period before the fur started flying. Over time, their animosity became so entrenched that their attacks were automatic. They seemed incapable of seeing, let alone respecting, the other person’s perspective. Each saw herself as the victim of the other, on the receiving end of unwarranted meanness, self-righteous in retaliation. I did everything I knew to do. We processed ourselves silly, went to counseling, discussed to exhaustion. Consequences were shrugged off. I kept them separated as much as possible, knowing that if they entered the same space, it would only be seconds before the air ignited with hostility. Finally, I realized that getting them to really understand the situation was a futile endeavor. Each was dug in too deeply. I decided I didn’t really care anymore if they “got it.” I needed the behavior to change, regardless of their understanding. So I sat them down at the table and made a proposal based on the only thing I thought might motivate them–money. I promised to pay each of them $1 a day to get along. They had to be affirmatively nice to each other–ignoring each other was not enough. Only I got to decide at the end of the day if they earned the money. And either they both earned it or neither did. They would make money or not as a team. Grace observed that this idea might cost me a lot of money. I thought to myself it would be a bargain at twice the price. It was a bargain indeed. The next day was a pleasure. They said please and thank you to each other. They offered to help each other with chores. They complimented each other. They were totally insincere, you understand. I didn’t care. But over time I saw that they changed at a deeper level. Breaking the cycle gave them room to breathe. Their defenses relaxed. Being kind, even if it was to get money, felt good. It felt good to the person being kind, and it felt good to the recipient of the kindness. They began to form new behavior habits. And after awhile I didn’t need to pay them anymore. Today Mia and Grace are good friends, even sisters. They laugh at all the things they said and did to each other. They apologize and forgive. The wisdom of the slogan “Fake it till you make it” is proven again. Fake kindness leads to genuine kindness. And genuine kindness leads to our happy place. I told the teacher what I was doing and she made a class project out of listing ways to be good friends (not singling out Mia or any other individual). Everyone got into it and had fun. The list was posted on the classroom wall. And Mia did become Peter’s new best friend. Yesterday, I was, in the words of Pema Chodron, hooked. Being hooked triggers our habitual fear responses. We can get hooked by something as simple as missing a green light when we are rushing somewhere. When you are hooked you feel a familiar tightening, a withdrawing, a wish for relief, a wish for things to be something other than what they are. Being hooked can make us feel angry, ashamed, anxious, jealous, and other emotions that poison us. There is a great ad campaign for Southwest Airlines. In the commercial, someone does something really embarrassing. As soon as the realization hits and the person wants to crawl in a hole somewhere, a voice says, “Want to get away?” It’s a great commercial, because all of us can relate to the person who has just goofed. We’ve all been there. I tried to pause, to sit with the feelings and not panic, to wait and see how things developed, to trust that everything would be all right. But it was too late. I was hooked like a fish who had swallowed the hook. My imagination was a runaway train, and my efforts did nothing to slow it down. I couldn’t eat. I felt sick. My world seemed to be crashing down around me. I raced around all day trying to anticipate and prepare for the worst. And then towards the end of the day, a miracle. The situation righted itself and all was well. It took me awhile to grasp that I hadn’t made a mistake after all. I took stock. I was wrung out. My stomach was still knotted up. I had a headache. It was like waking up from a bad dream. And that is all it was, after all. A dream I made up and then believed. I laughed weakly and practiced a little compassion on myslf. My therapist used to tease me gently when I would fall off on my high horse expectations of perfection. “Welcome to the human race,” she would smile. It’s good to be home. So here it is–the essential message of the whole Bible. Wake up. Grow up. Wake up, meaning: See the world as it really is. Grow up, meaning: Accept life on its terms and not your own. Wow, I thought. The whole Bible in four words. (To think I spent an entire year reading it from cover to cover.) And then I thought, this is really the essential message of Buddhism, too, at least as I understand it. And isn’t this really what I learned from all those years in therapy? Clearly, these four words have wider application. Wake up–see the world as it really is. What would our lives be like if we were awake? Buddha means “the awakened one.” Here is my favorite story about Buddha. From Plato’s theory of shadows to the present day, we are intrigued with the idea that what we spend most of our time reacting to as “reality” is not true reality. For example, the idea that we are separate from one another is born of fear rather than truth. When we wake up, we realize that there is nothing to fear because we are all united at our deepest energetic (soul) level. Grow up–accept life on its own terms and not your own. Recovering alcoholics know all about growing up. It is the essence of the serenity prayer used in 12 step programs. “God, grant me the serenity to accept the things I cannot change, the courage to change the things I can, and the wisdom to know the difference.” This is also a great prayer for control freaks. I’ve used it more than a few times myself. In her book Radical Acceptance, Tara Brach says, “Radical Acceptance is the willingness to experience ourselves and our life as it is. A moment of Radical Acceptance is a moment of genuine freedom.” Accepting life on its own terms frees us from so much pain. Wake up. Grow up. 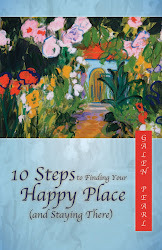 Maybe I don’t need ten steps to find my happy place after all. Maybe I just need these two. I am still learning about this blog business, but I have added two things you might like. First, I figured out how to make commenting easier. Now you can comment whether you have a Google account or not, and you can comment anonymously. I hope you will feel free to share your thoughts and ideas now that it is easier and more private. Just click on the little pencil and the word "comment" at the end of any post. The number of comments also appears there and if you want to read other comments, just click on the same place. Also, I added an email link at the top of the right column. You can click on that and email me directly. I would love to hear from you. Thank you for stopping by to check out the blog. I Had a Great Week, Thank You! Several times this week, I caught myself complaining when someone asked me how I was, or how my week was going. Why did I do that? Why did I respond that I had spent a lot of frustrating time on hold on the phone instead of saying that I was enjoying the early spring? Why do we often try to connect with each other by sharing our annoyances rather than by sharing our joys? To change a habit, we must first be aware of it. Try to notice when you complain. When do you tend to complain? To whom? About what? Once we become aware of our complaint habits, we need to substitute a more desirable habit. If you want a toddler to hand over some inappropriate but coveted object, what is the best approach? Yank it from his hand? Or offer him something more attractive? Our minds work the same way. If you simply try to stop the bad habit, it will flow back in to fill the void. So when you catch yourself complaining, substitute a positive thought. You will feel happier yourself, and you will lift up those around you. Misery might love company, but joy creates company. Good company. Martin Luther King, Jr., inspired millions by describing his dream rather than by describing his pain. Remember the movie Six Degrees of Separation? The premise is that any person is separated from anyone else on Earth by no more than six degrees. That is, if you are one step away from everyone you know, and two steps away from everyone they know, it will take at most six steps to connect you to anyone on the planet. My personal theory is that if you grew up in Memphis, like I did, you are separated by no more than two degrees from Elvis. So ponder that for a moment. Every time you separate yourself from another person, you are separating yourself from God. Every time. Very hard to live in your happy place if you are separated from God. On the other hand, it is very hard not to see as separate that person who was really rude in the checkout line at the grocery store. Or the homeless person reeking of booze asking you for money. Or the CEO of a bailed out company pocketing a gazillion dollar bonus. Or your ex. Yet many faiths and psychological theories stand firm on the foundation that our ticket to our happy place is our connection with others. Which brings us to the good news. Every time we open our hearts and connect with another person, we connect to God. Every time. So that gives me pause, at least occasionally, when I am poised to cast that first stone. Is it worth separating myself from God? Is it really? As Pogo said, “We have seen the enemy and he is us.” There is no them. There is only us. Namaste. Here is a cumulative review of some habits that will help us reset our homepage and stay in our happy place. Some of the techniques might be relevant to more than one step. The list of all 10 steps was posted Feb. 3. Step 1. Give yourself permission to be happy. When you have a choice to make, choose in alignment with your passions. Step 3. Give up the delusion of control. When life presents you with a game change, try to open rather than close your heart and see what happens. Step 4. Feel your feelings. As you go through your day, notice people. Remind yourself that the person you are noticing might be Jesus. When your heart feels hard, contemplate Amish forgiveness. If you are unable to forgive someone, bless that person every time you think of her. You might say, “God bless [name] and please help me mean it." Repeat until you do! Step 9. Develop an attitude of gratitude. When something rubs you the wrong way, say, “I’m grateful for that!” Keep thinking of things to be grateful for until you really are grateful. Step 10. Enter the gate. When life presents you with a game change, try to stay in the present moment. Stay open and listen. Attend. I just read a book titled Game Change about the 2008 presidential election. The authors used the term “game change” to refer to those moments in the campaigns when the wind shifted, or the sun broke through, or the tsunami hit. As she began telling the story, I felt the ground shift under my feet. It seemed like I was inside a tank turret looking through the little rectangular opening and the gears began whirring as the turret turned to aim in a different direction. I didn’t want it to turn. I wanted to get James and my daughter and head up to the mountains for a relaxing weekend. I did not want to hear about Dan. In my mind, I covered my ears with my hands and started singing, La la la, I can’t hear you! But I did hear, and my life was changed. I wanted my life to go on as it was, but my life could never be as it was because now I had a choice that was not there moments before. My life was changed no matter what I chose. Two weeks later, on the day his mother died, Dan joined our family. He was 14. He and James became brothers. Now they share an apartment in a small complex operated by a wonderful organization serving the needs of adults with developmental disabilities. They will always have each other.